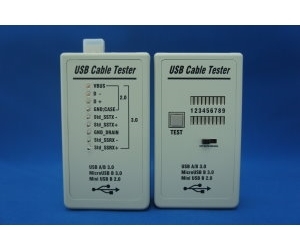 The USB Cable Test Set is designed to provide fast convenient verification of proper pin connections of USB cables. The set includes a Main Test Unit, and Remote Test Receiver. The main unit will work as a standalone tester, with OUTPUT (USB A/F) and INPUT (Micro USB B/F, Mini USB B/F) connections for both ends of an USB cable. It is ideal for testing most interconnected cable prior to installation on equipment. The remote receiver includes an INPUT (USB A/M, USB B/F) connection only, and is used in conjunction with the main unit, when both ends of the cable are not near each other. This set sequentially tests continuity of each signal path which present on an USB cable. In automatic mode, the set will test Path #1 ~ #9, one at a time, with LED indication of continuity on each path. The tester may also be placed in manual mode, allowing the installer to individually select each path at the pace you want.